Sri Lankan authorities are reported to be taking measures to ensure safety at sea, following the recent incident of a boat capsizing off the Katukurunda beach with 40 people on-board. For a country looking to exploit the potential of the sea for tourism, this accident has sent a strong message and call for proactive measures to be taken up. 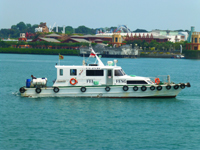 The government has banned the use of fishing craft for passenger ferrying. However, there remains an urgent need for stricter regulations to prevent overcrowding of boats and for safer travel by sea. Lack of resources for passenger ferry services, and a lack of interest in ensuring passenger comfort and safety inside vessels – including the compulsory use of life jackets – are deemed reasons for misfortunate accidents, affecting passengers and crew. While the seaworthiness of vessels and the sea-going range of the same have to be regulated, the authorities also emphasise that boat crews need to have minimum swimming and lifesaving as part of their skill set when operating small-scale ferry services.